I just can’t say no to fried chicken. I don’t eat it often, maybe once a year, but when I do I’m in seventh heaven. While in the Bay Area this weekend, friend Lucy (fellow food lover) took me and the special man friend to Farmer Brown, which serves up farm-fresh soul food on the cusp of Union Square and the Tenderloin. We sat at the bar and, while really only planning to order drinks and snacks, something on the menu caught my eye — fried chicken and a beer for $15. 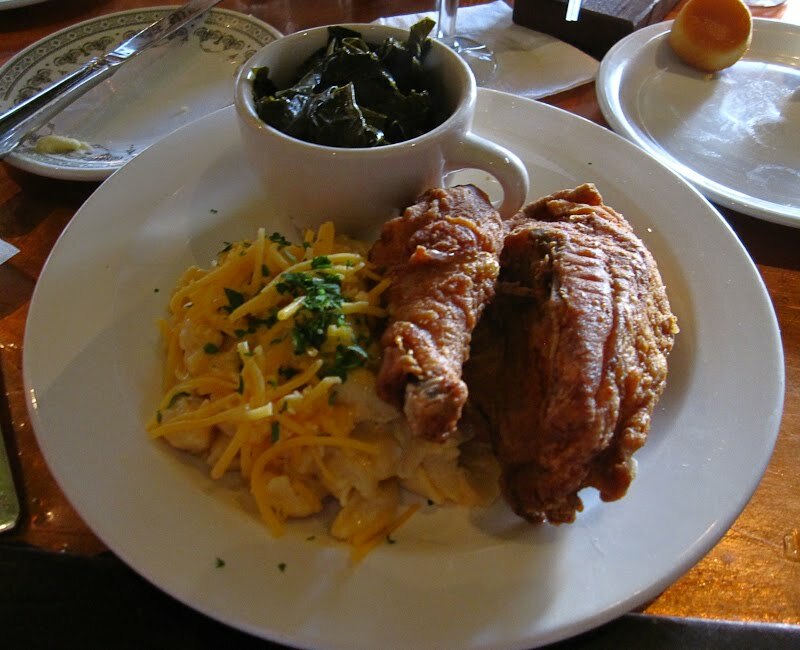 This was no small plate — the dish came with two perfectly fried pieces of chicken, a breast and a drumstick that had a wonderfully seasoned, just-like-grandma-used-to-make flavor. Accompanying the chicken was some of the best macaroni and cheese I’ve ever had (so rich and sharp) and extremely flavorful, earthy, salty ham hock greens. Thanks to all that, and a glass (well, a jar) of Marin Brewing Company Mt. Tam Pale Ale, I left stuffed, sassy and satisfied. Their entire menu looked divine, but I’d order this again in a heartbeat. St. Patrick’s Day is a fun one to celebrate, but I’m not the biggest fan of corned beef. Actually, it turns my stomach, to be quite honest. So, for the sake of being festive, if not completely culturally accurate, I picked up some British-style bangers to make bangers and mash. 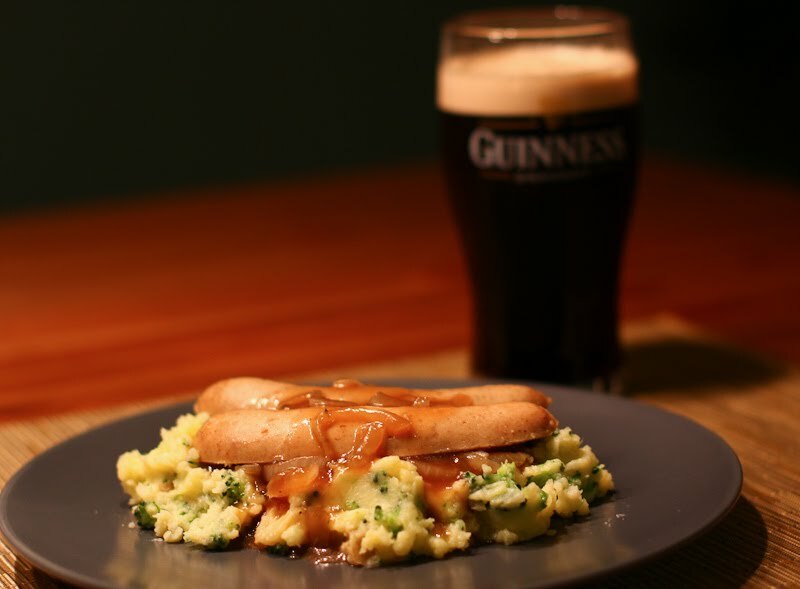 The green potatoes and the Guinness gravy were my homage to the Emerald Isle, and everything tasted great paired with a Smithwick’s Irish Ale. Melt butter in large saucepan over medium heat. Add onions, stirring constantly, until softened, 5-10 minutes. Use fork to poke holes in bangers and add sausages, broth and Guinness to pan. Allow to cook, covered, over medium heat for a minimum of 10 minutes, at least long enough for the bangers to heat all the way through. Once bangers have simmered to your satisfaction, remove them from pan and place on a plate. In small bowl, whisk together cornstarch and water to create slurry, which you’ll stir into onion sauce to thicken. Serve bangers with Green Potato Mash, applying gravy to bangers, mash or both. Bring potatoes to boil and cook until soft. When potatoes are close to done, heat milk in saucepan with butter over medium heat until butter melts. Remove from heat. Drain potatoes in colander and transfer to large bowl. Add broccoli, grated cheese and milk mixture and coarsely mash with a potato masher. Season with salt and pepper, and serve. I can’t roll an enchilada to save my life. No matter what I do, I can’t seem to keep corn tortillas from splitting at some point in the rolling process. This results in lots of enchilada casserole for dinner, which still tastes great but it just doesn’t look as cool. I subbed flour tortillas for the corn ones with my most recent batch of enchiladas. I recall one of my college roommates making some pretty solid enchiladas with flour tortillas, so why not give it a try for myself? I had much better luck rolling the flour tortillas. I couldn’t find small flour tortillas when I hit the store, and eight medium tortillas were all I needed to fill a 9-by-13 baking dish. Everybody has a go-to cheese for their enchiladas, and I normally like to use either medium cheddar or Monterey jack. We recently found some chipotle cheddar at Winco, which added a nice flavor to this batch. These enchiladas took less than an hour to make. Obviously nothing tops fresh, homemade ingredients, but there’s no shame in utilizing shortcuts, especially on weeknights! I try to keep a bag of cooked shrimp in the freezer, as well as a bag of corn kernels. With that in mind, I’ve written the recipe from the point that all frozen ingredients have been thawed. I also use pre-made enchilada sauce. Preheat oven to 350 degrees. Warm enchilada sauce in a saucepan over medium heat. Ladle enough enchilada sauce to lightly coat the bottom of a 9-by-13 glass baking dish. For each enchilada, dip a tortilla in sauce and place in dish. Add shrimp (I planned for about 5 shrimp per enchilada), and a spoonful of beans, corn and some shredded cheese. Roll each enchilada so all eight sit snug in the baking dish. 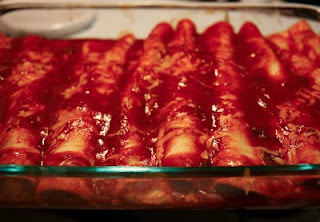 Pour remaining enchilada sauce on top, sprinkle with remaining cheese, cover dish with foil and place in the oven. Bake 20 minutes, or until cheese on top of enchiladas has melted.